The FBI says an "armed and dangerous" 18-year-old white woman obsessed with Columbine is dead. Because of warnings about the woman named Sol Pais, more than a dozen school districts in Colorado were closed Wednesday. Jefferson County Sheriff Jeff Shrader told reporters Wednesday that she died "from an apparent self-inflicted gunshot wound." The FBI had said there was an active investigation "around the base of Mount Evans," a Rocky Mountain peak west of Denver. Minutes before announcing her death, the FBI's Denver field office had said she was "no longer a threat to the community." The 20th anniversary of the Columbine shooting is Saturday. Pais flew from Miami to Denver on Monday and "immediately" bought a pump-action shotgun and ammunition, FBI Denver Special Agent In Charge Dean Phillips told reporters Tuesday evening. Pais had "made some concerning comments in the past" and had an "infatuation" with the 1999 Columbine High School shooting and its perpetrators, Phillips said at the press conference. Phillips said law enforcement had no specific information about a threat to any one particular school, but they thought it was a "credible threat certainly to the community and potentially to schools." "This has become a massive manhunt," with multiple law enforcement agencies searching for Pais, Phillips said. Pais had no specific known connections to Colorado, Phillips said. Denver Public Schools were closed Wednesday, as were Jefferson County (Jeffco) Public Schools, of which Columbine is a part. Fourteen other school districts in the area are closed as well, according to Colorado Public Radio. 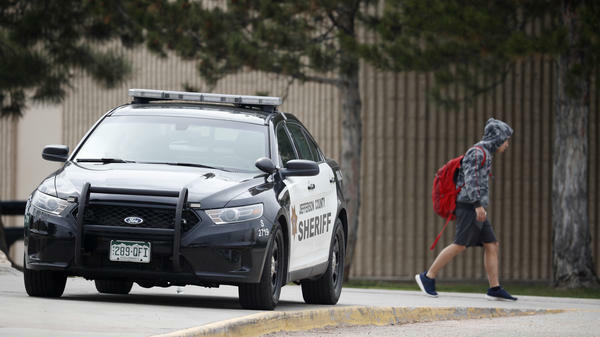 Columbine High School and several others in Jefferson County were placed on "lockout" Tuesday, which means entry and exit were restricted while classes continue as usual. "We take these threats seriously," Shrader told reporters. It's "not the first threat" to involve or reference Columbine, he said, and "I know that this opens a wound especially on an anniversary week." Jason Glasse, the superintendent of Jeffco Public Schools, told reporters on Wednesday that officials are planning for students to return to the classroom the next day, "with heightened safety and security procedures, and ongoing vigilance in the days to come."